Scottish Gamekeepers Association Chairman Alex Hogg (left) and Cabinet Secretary for Rural Economy and Connectivity, Fergus Ewing, with award winner Sandy Reid (third from left) and wife Mairi at the trophy presentation. A man whose vast knowledge of Scotland’s moorland species sparked a pioneering wildlife tourism attraction in Perthshire yesterday (FRI) landed a prestigious national award. Sandy Reid (73), a deer stalker on Atholl Estates, was at the forefront of a move, back in 2005, to showcase the estate’s bountiful wildlife to visitors through a wildlife land rover ‘safari’. Since then, Sandy has driven hundreds of visitors across Atholl’s moors to photograph iconic red deer Stags, resident golden eagles and lekking black grouse. It is a move which has since been rolled out successfully on other Scottish sporting estates, contributing to a burgeoning wildlife tourism sector worth £127 million a year to Scotland’s rural economy. Yesterday, the retired stalker’s vision was rewarded with the Ronnie Rose Trophy from The Scottish Gamekeepers Association, named after the late forester, wildlife manager, MBE and author. The silverware, which recognises years of dedication to conservation or education in game management, was presented to Sandy at Moy Highland Field Sports Fair by Rural Economy Secretary, Fergus Ewing. Sandy, who led stalking guests on the 150 000 acre estate for 49 years before running the safaris, said: “The project has been really successful in terms of education and it is an honour to receive this award from The Scottish Gamekeepers Association and the family of the late Ronnie Rose. “There are many people who do not know what goes on beyond the A9. They don’t see the vastness of the land and how it is managed every day to produce an income and biodiversity. “On one of the beats at Atholl, we have 186 black grouse and I am able to drive within 20 yards of them to let visitors see the lekks. People love to see the red deer close up, in the early morning or at nightfall, and I’ve had people in the back seeing Hen Harriers stealing food from each other in mid-air. “It’s a chance to let people see what really goes on, how abundant predators are legally managed by the gamekeeping staff to promote a balance. It is also a way to speak to people and explain things like why eagles need large territories to bring up young. Despite a busy safari schedule, Sandy still ghillies for guests on the estate’s salmon beats and flanks on grouse days around Perthshire and further afield. He started his career as a pony boy and kennel hand before becoming a stalker on the Clunes beat at Atholl. Scottish Gamekeepers Association Chairman Alex Hogg said: “Sandy stood out amongst all the nominees for the way he continues to impart his wealth of knowledge, particularly to those coming at countryside management afresh. People love to see the huge range of wildlife we manage in Scotland. They don’t want to look at pictures; they want to see the real thing. This will be the second awarding of the Ronnie Rose trophy for game/wildlife managers. It is awarded to individuals who have been nominated by peers for long service and lasting contributions to conservation or education in the undertaking of game management duties. In the two years to date, the SGA has received nominations from all over Scotland. Once received, a winner is decided by a vote of the full SGA Committee in consultation with the Rose family. The award was inaugurated in 2015 in memory of Ronnie Rose, who died in December 2014. 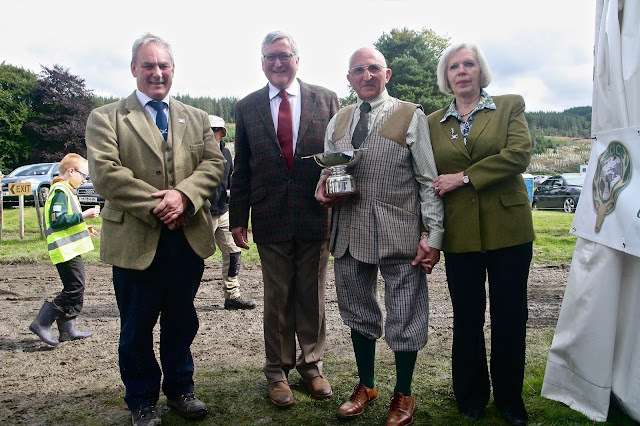 The trophy was specially commissioned by The Scottish Gamekeepers Association, in association with the Rose family. Ronnie Rose was a pivotal figure in the establishment of the SGA, a life member, award winning conservationist, author, MBE, forester and wildlife manager. Over a 50 year career, Ronnie Rose received many conservation accolades including the Balfour Brown Trophy for Humane and Sustainable Management of Deer. His principles of forest design, which viewed wildlife as an asset, saw him oversee a 300 per cent increase in bird species in the forests of Eskdalemuir. At neighbouring Blackhouse Forest, his management saw lekking blackcock rise by over 50 per cent at a time of spiralling national decline. His book, Working with Nature: The Conservation and Management of Scottish Wildlife is still widely read and appreciated today. Sandy Reid (73) was a deer stalker on Atholl Estates for 49 years. Eleven years ago, close to his retirement age, he had a vision to take visitors out onto the 150 000 acre estate - famous for its Castle- to see the bountiful wildlife, using only a Land Rover and the knowledge of the local species he had amassed over his lengthy career. Sandy's safaris at Blair Atholl are now an important part of the estate and Castle's tourism offering and his idea has been successfully copied on many estates in Scotland, contributing to the nation's wildlife tourism offering, worth £127m a year to the rural economy. He has introduced hundreds of 'newcomers' to the flora and fauna of Highland Perthshire and helped them understand more of why land is managed the way it is, in Scotland. Sandy educates tourists on wildlife management and gets them ‘up close and personal' with iconic red deer, golden eagles, Hen Harriers, native red squirrel and lekking black game. At the age of 73, he still ghillies for guests on the Atholl salmon beats and flanks at local grouse days. He has spent a lifetime dedicated to the land and its many species. His tours are a way of giving something back to others for all the joy he has received from it himself.